Nearly every world cuisine features some kind of meatball dish and kofta is the Middle Eastern version. At its most basic, its a mixture of very finely ground beef, onions, herbs and spices. The meat is formed into balls or, more commonly, cigar shapes, and either baked or grilled. The term kofta, and variations of the recipe, can be found throughout the Middle East as well as parts of Europe and India. The Middle Eastern versions are most often made with lamb, beef or even chicken. In the Mediterranean, pork might be used and vegetarian options are found in India. Kofta kabob refers to cooking the meat on skewers, either in the oven or on a grill. It's usually served off the skewer on a bed of rice although sometimes you'll see the skewers left on for presentation. But kofta, in the non kabob form, may be cooked in a sauce, most often a spicy curry in Indian cuisine. The skewered version tends to be served for dinner but often kabobs are considered fast food and are served inside a pita or flatbread for a quick, portable meal. Unlike most meatballs, kofta recipes call for extra finely ground beef. Ask your butcher or the meat department to run the beef through the grinder one or two extra times. It makes a difference in the recipe - the meat will be smooth and have a softer texture. If you're buying pre-packaged ground beef and the butcher can't do another grind, try pulsing it a few times in the food processor for the same effect. 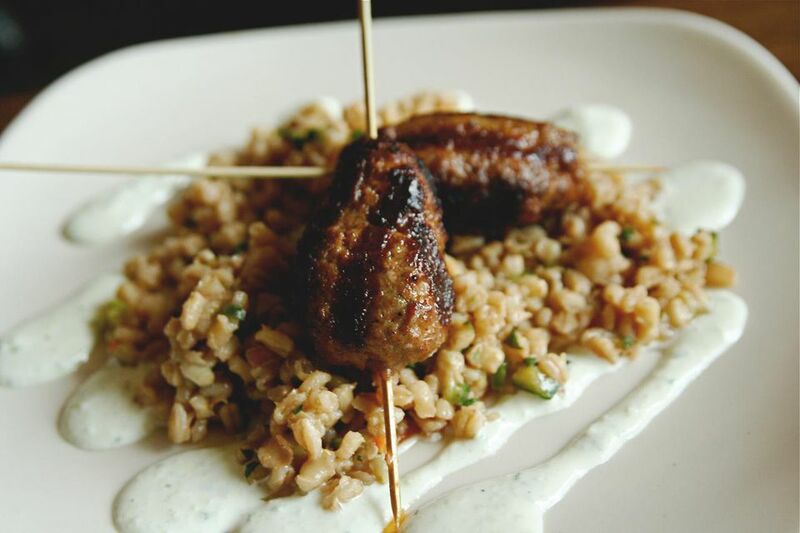 Although the basic kofta recipe is quite plain, there are a multitude of variations. Different herbs and spices, of course as well as the addition of rice, bulgur or vegetables in with the meat. Finely chop the onion and parsley. Time-saving Tip: Use a food processor. Add the ground beef to a large bowl and stir in the onions and parsley. Form the beef mixture into small balls and place four or five balls onto a metal skewer. Shape the meat into a cigar shape on the skewer. Note: if you use wooden skewers, be sure to soak them in water for 30 minutes first to avoid them burning. Bake the skewers for 45 minutes. Or if grilling, grill for 20-25 minutes or until done. Kofta is often served on flatbread (without skewers) or pita bread. It is also common to see it served on a hot dog bun.